The worst kinds of stories are the ones where the hero is undeniably in the wrong position. When somebody isn’t cut out for the position they’re in, the believability of your serious narrative are thrown out the window and in to oncoming traffic. 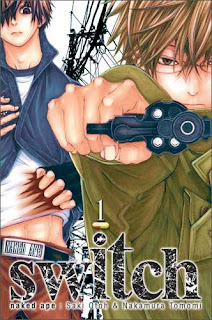 Such is the case with Switch, the story of two narcotics cops, Hal and Kai. Kai seems kind and caring but, of course, turns into a ruthless killer without warning. Further messing with the practicality of this narcotically-charged manga is the art style – though totally spectacular and gorgeously detailed, each character is a stereotypical long-haired pretty boy with such big watery eyes that you’ll wonder if you didn’t trip and fall into Death Note. The bizarre tall-child look of each of the characters and generally indiscernible character designs means you’ll be mixing up who’s arresting who, who’s a good guy, bad guy, victim, attacker etc. It’s tough to focus on the nefarious Chinese drug cartel investigation going on in the background when you can hardly make out what’s going on with the heroic detectives in the foreground. The story does manage to pick up towards the end of the first volume. Despite being buried beneath main character Kai Eto’s weak and childish wiles, the plot manages to pick up in the latter half, complete with new and interesting characters who seem to have a violent streak in them that will leave you anxious for the next book at the climactic cliffhanger. Each officer in the Narcotics Division obviously has a storied past that we’ll get to check out in later volumes, but the mystery surrounding Kai’s subtly-hinted-at grim history of violence remains the most interesting but, in this volume, underdeveloped. His inconsistency in being a wimpy narc to a subtly sadistic killer isn’t explained as of right now, so that’ll definitely irk you ‘til you figure that one out. Each page is richly detailed with meticulously drawn locales and characters, which not only makes reading and keeping up with the drama and teeny bits of action more entertaining, but more comprehensible. A rocky and confusing start will throw readers through a loop, but a quick reread will clear up some of the rough edges and make you appreciate the underlying story bits a little more. The reread, however, might not be something you’ll be interested in. Random events that convenience the plot’s protagonists will eliminate any fear or worry you have about them. So no matter how sticky a situation might become you’ll always have the reassurance of a surefire miracle to save the day. Yawn. In spite of a decent story, the whole thing feels messy and like it doesn’t know where to go. The aforementioned cliffhanger is intriguing enough to make you consider the second volume if the first didn’t aggravate you with its main character (who is obviously too much of a sissy to be bringing down dealers in the Narcotics Division). The drama and potential development are enough to warrant checking out, but the naiveté of Kai and the lack of situational explanation will leave you lost.